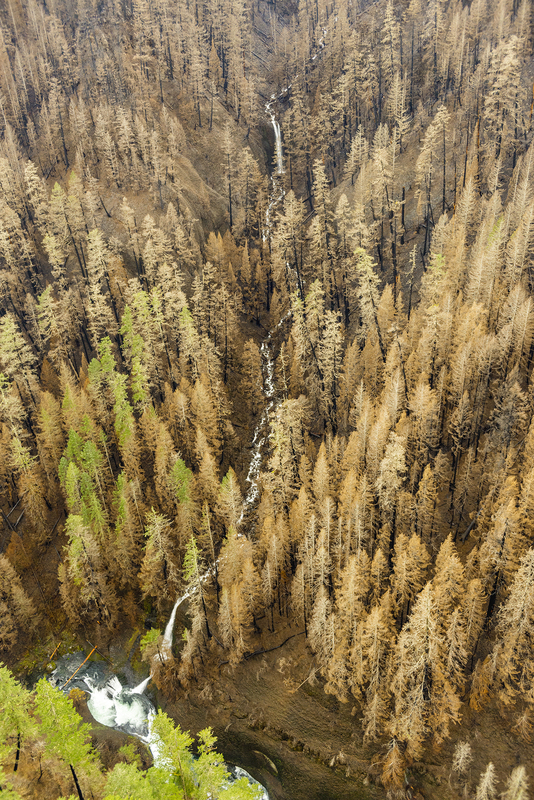 September marked the one-year anniversary of the Eagle Creek Fire, the now-infamous, human-caused burn that charred 50,000 acres on the Oregon side of the Columbia River Gorge. 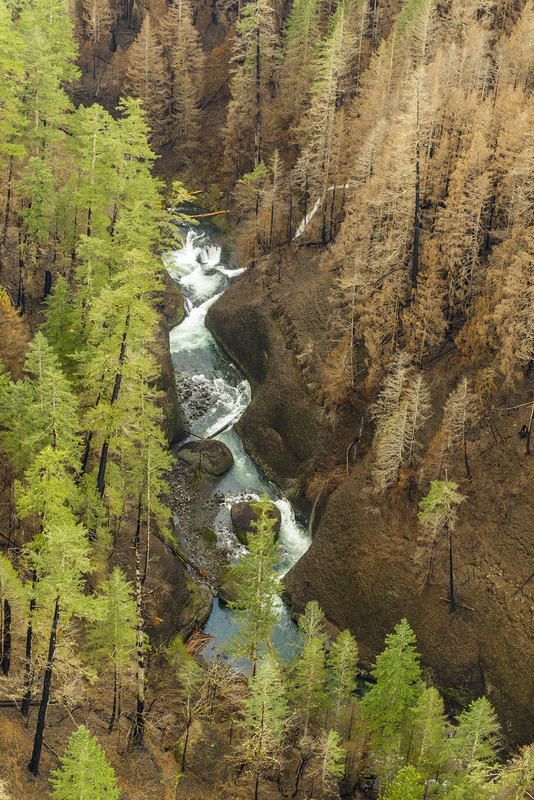 Today, much of the burn is still closed to public access, though Forest Service and Oregon State Parks crews have been working with volunteers within the restricted zone to steadily reopen the miles of trails that were affected by the fire. 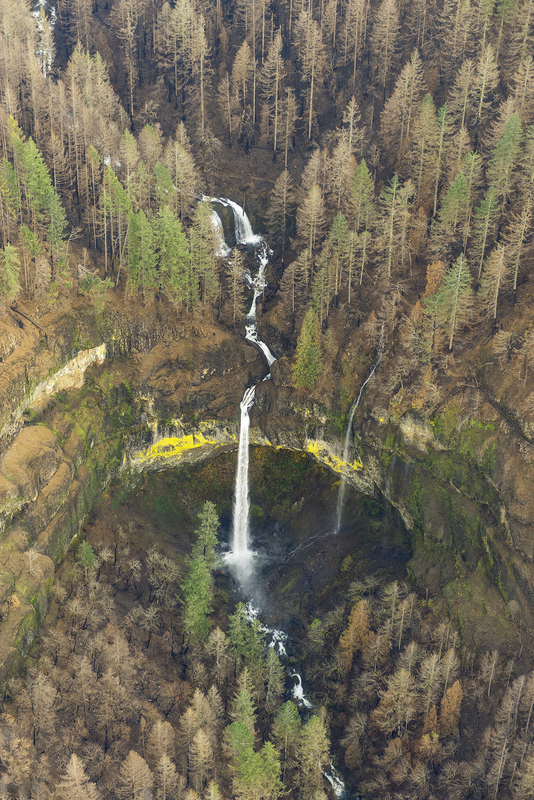 I met Nate Zaremskiy on one of those volunteer efforts last spring, where we worked with a Trailkeepers of Oregon (TKO) crew to restore the Larch Mountain Trail above Multnomah Falls. Nate is an avid hiker, outdoor photographer and Gorge advocate. 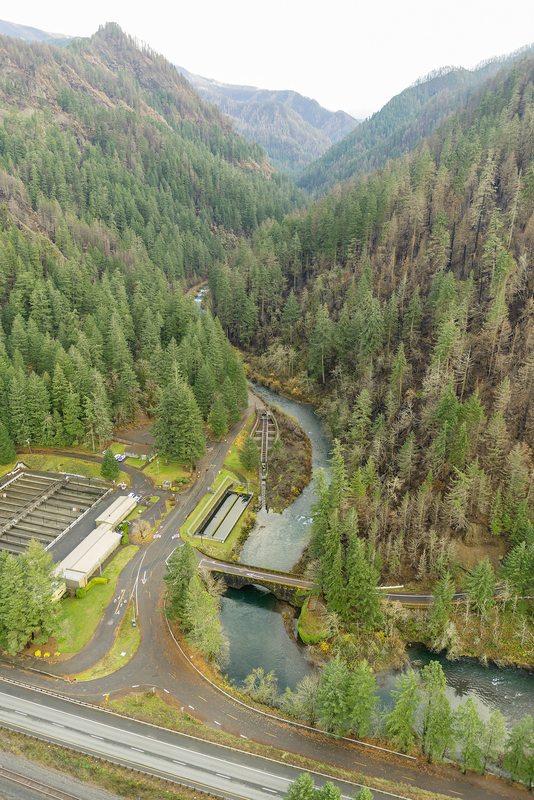 At just 20 years old, he is one of the heroes in the Gorge recovery effort and the inspiring face of a new generation of Oregonians dedicated to conservation and stewardship. Nate has been busy this year as regular trail crew volunteer with the Gorge Recovery Team partner organizations on restoration projects throughout the restricted zone, including both TKO and the Pacific Crest Trail Association(PCTA). In September, Nate served on an overnight PCTA crew focused on restoring the upper section of the Eagle Creek Trail, in the heart of the burn. On this trip, he was part of a small scouting party that was the first to visit the section of trail from High Bridge to Twister Falls. 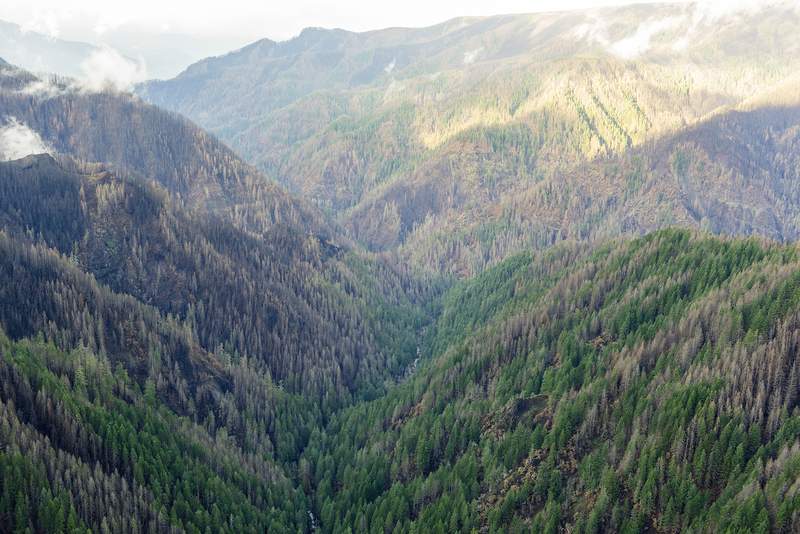 His photos from the scouting trip both jarring and encouraging, as they show not only the impact of the burn but also how the Gorge ecosystem has already begun to recover in this first year after the fire. 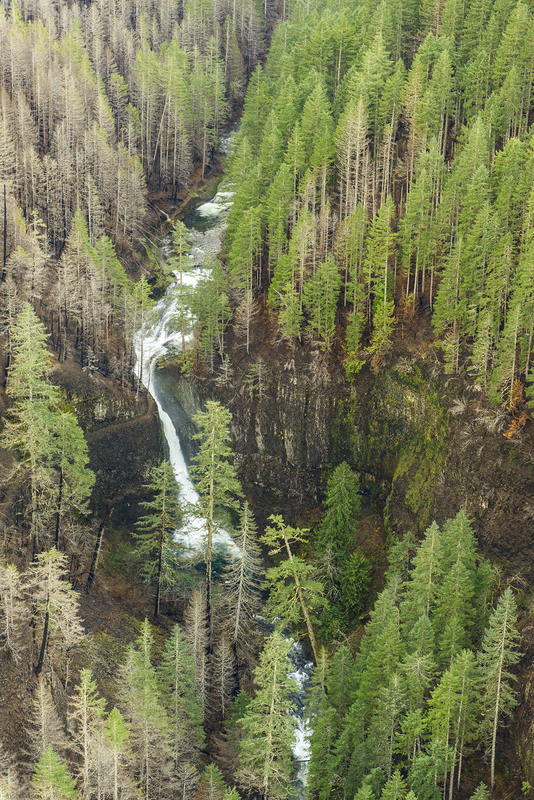 The following is a recent interview with Nate that features startling photos from his amazing scouting visit to the Eagle Creek Trail. 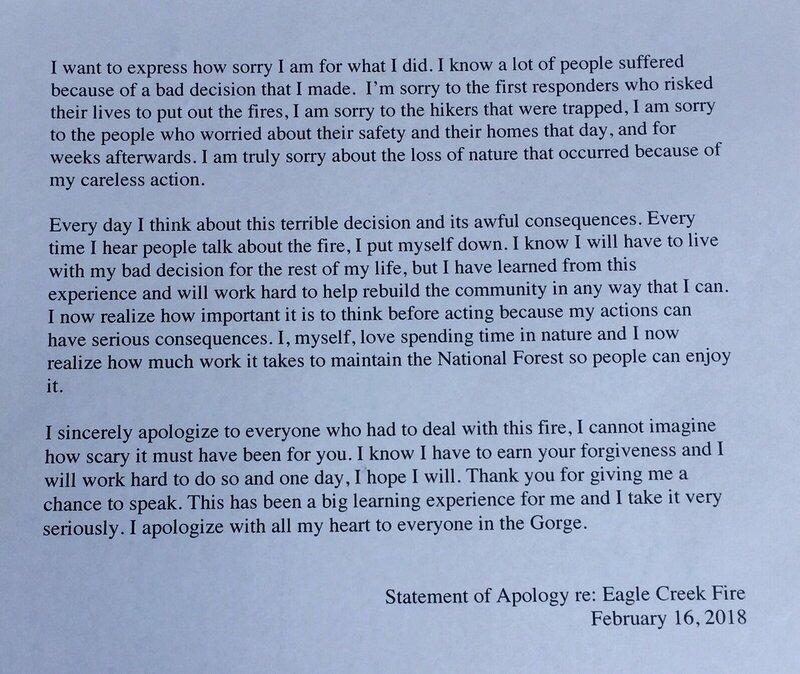 Tom: Nate, thanks for taking the time to share your experience from the one-year anniversary trip to Eagle Creek and for all your recovery work in the Gorge this year! Tell us about this particular trip to Eagle Creek — it was an overnight PCTA project, is that right? Nate: My pleasure, Tom! Thanks for having me on your blog! Yes it was, the crew set out on the morning of September 1 from Wahtum Lake, which happened to be the eve of the fire’s anniversary. The goal for this trip was just like any other I’ve been on, except I wouldn’t be enjoying a nice big burger in Cascade Locks for a couple nights. Instead the crew would be enjoying our stay together at campsite in a small island of surviving trees, sharing stories and just having a good time. Our goal for the next couple days on the project was to clear brush, do some tread reconstruction and create a passable trail on some of the rougher stuff trail sections near Tunnel falls. 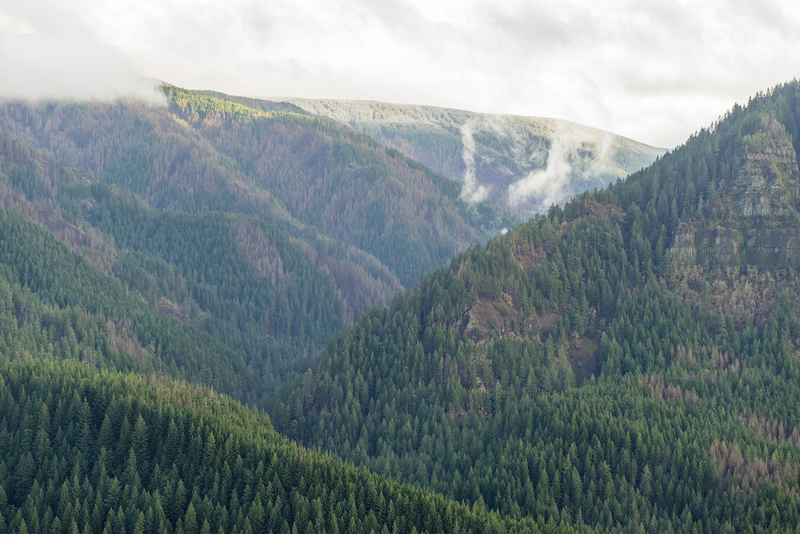 Tom: Your photos from the trip capture the descent from the green forests around Wahtum Lake to the total burn in the upper reaches of the Eagle Creek canyon. What was it like to drop into the burn in this way, knowing that you were among the first to be there after the fire? Nate: It was a very interesting and a unique hike. It is definitely something I’ll remember for the rest of my life, simply because of the sheer scale of the Gorge Trails Recovery Team efforts in the burned area this year. Hiking past the crystal clear blue waters of Wahtum Lake and the thick greens along the upper trail, only to eventually come to a place where almost nothing is alive, really hits you. I’m not really sure what word I’m looking for to describe the feeling. It felt awesome that we were among the first back to the canyon, which felt really special, very special. I’m not sure if everyone felt the same way, but I felt like this was more than my day crew experiences elsewhere in the Gorge. This was something more sacred, I guess you could say, at least to me. 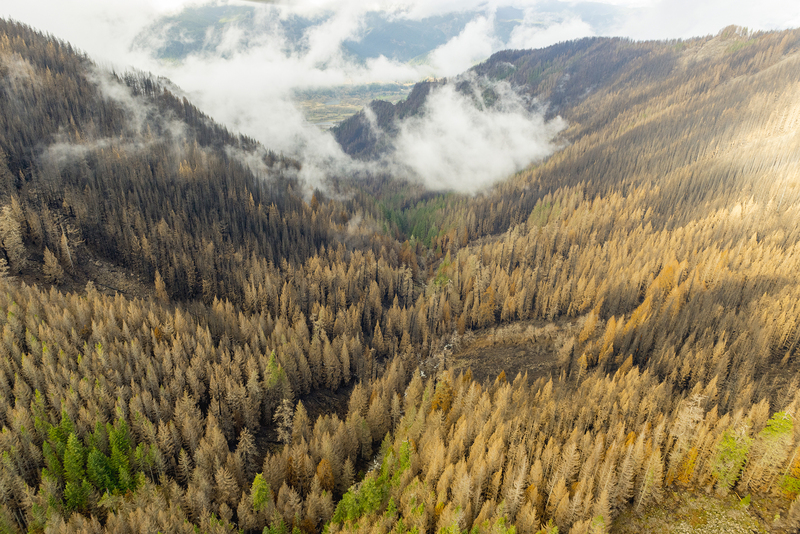 Tom: When we met on the Larch Mountain Trail last spring, one of the really notable changes at that relatively low elevation was the amount of regrowth from understory plants whose roots has survived the fire. Lots of sword fern and vine maple had survived, and many of the bigleaf maple and red alder also had new growth bursting from the base of burned trunks. 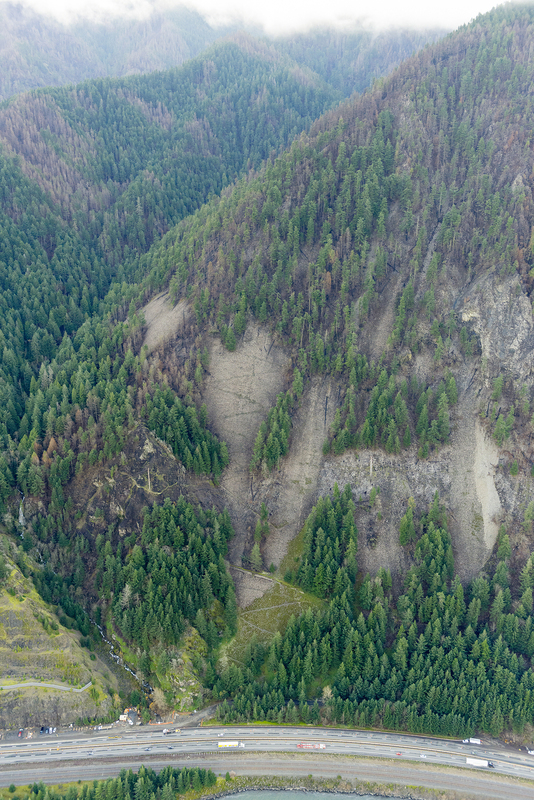 Did you see a similar recovery occurring at higher elevations along the upper sections of Eagle Creek? Nate: I did, in many places! Especially down in the canyon. I saw lots, and I mean LOTS, of new growth taking over the burnt remains. Even in the most burned parts of the trail, I saw at least some green on the ground trying to recover, a lot of ferns, mainly. Tom: We also saw a “mosaic” burn pattern along the Larch Mountain Trail, where the intensity of the fire varied greatly from place to place, allowing the forest over story to survive in many areas. Was that true along the upper section of Eagle Creek, as well? 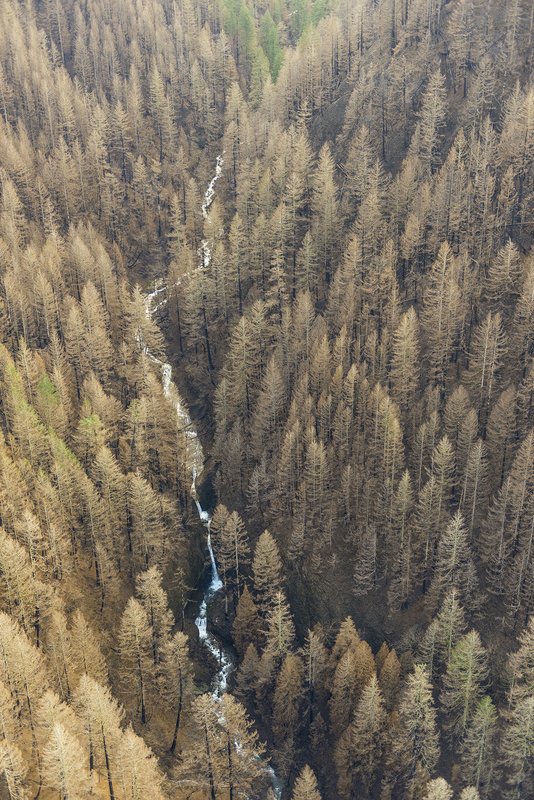 Nate: From where we first entered the burn zone to just a mile and a half above 7½ Mile Camp, the forest was just completely blackened. However, as we got closer to the creek, we saw more and more live trees, especially near streams. I can’t remember exactly, but it looked like the ridge across Eagle Creek from 7½ Mile Camp might have burned more in the mosaic pattern, but I can’t really be sure. I did notice that a lot of trees beside Eagle Creek survived. 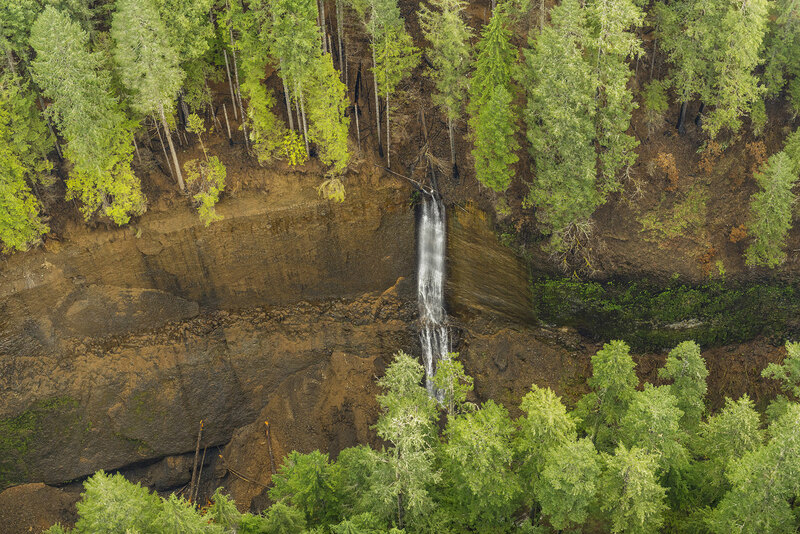 Tom: One of your photos shows Sevenmile Falls, which is the uppermost in the string of waterfalls along Eagle Creek, and located just above Twister Falls. 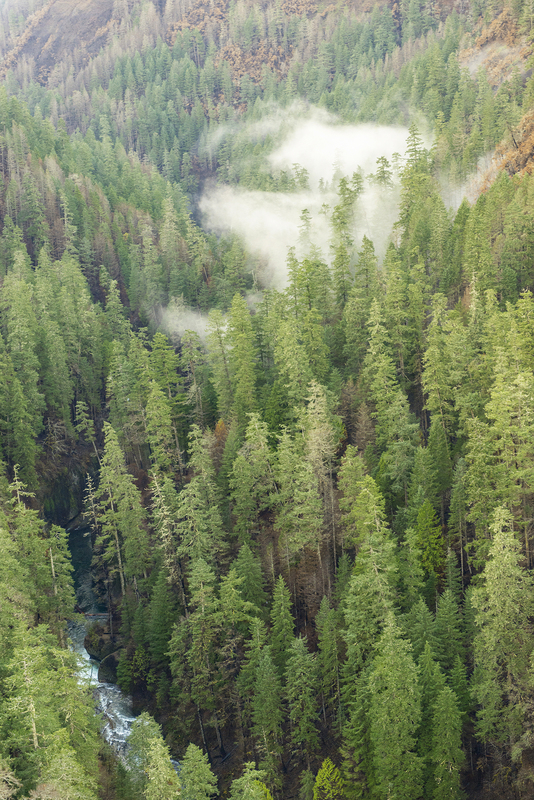 It looks like much of the forest canopy survived there — can you describe it in more detail? Nate: Sevenmile Falls was one of the more promising spots along the trip, the trees around it survived very well. The trail was pretty torn up, and lots of slides and small trees made for a bit of a treacherouspassage, but a lot of vegetation and large trees have survived pretty well in that area, especially on the south side of the falls where the sun didn’t dry the cliff out as much. Tom: You also have several shots of Twister Falls, and it looks like more of a mosaic burn pattern here. What did you see on this part of the trail? Did the steepness of the canyon here affect the burn? Nate: Amazingly, the base of the falls and a few hundred feet downstream looked untouched, pretty much pure Gorge jungle. Looking above the falls, I saw a lot of burned trees, though, so I’m not really sure if the canyon had much to do with it. Tom: The Eagle Creek trail is famous for being built right into the cliffs, and the section just below Twister Falls is known as the “Vertigo Mile” for the dizzying turn it makes high above the falls. 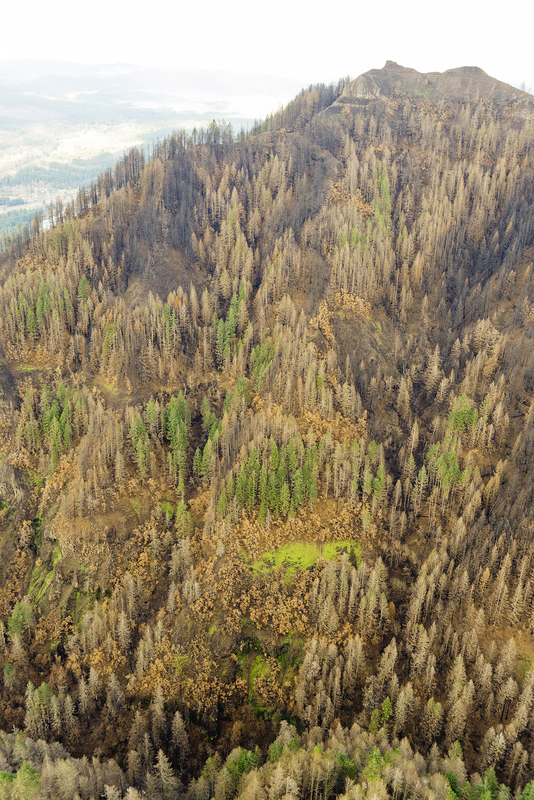 Your photos show a pretty significant fire impact on the forest in this area. But the actual trail, including those VERY helpful hand cables, looks like it survived, is that right? Nate: You’re right, the cables did look like they survived the fire, enough for us to hold onto them at least! I’m not sure if they are one hundred percent trustworthy, though, simply because of their age and going through a fire. You never know what has fallen on them, and if the heat from the fire affected the metal at all. The trail was in really good condition from Twister Falls to just before the turn toward Tunnel Falls. The overhanging cliff probably acted as a barrier and sent rockslides out just enough to avoid impacting the majority of Vertigo Mile section of trail. 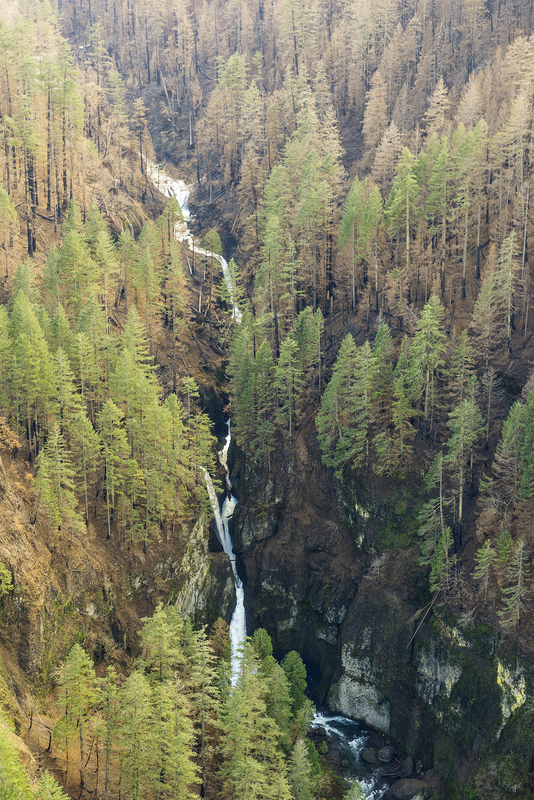 Tom: Perhaps the most iconic spot along the Eagle Creek Trail after Punch Bowl Falls is Tunnel Falls, at about the six-mile mark on the trail. 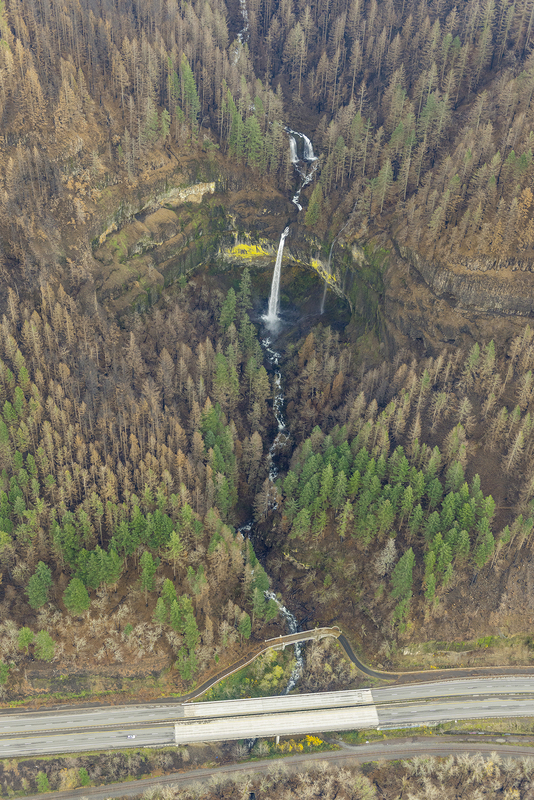 In an earlier WyEast Blog article on the fire, I posted aerial photos that showed this part of the canyon to be pretty heavily burned. 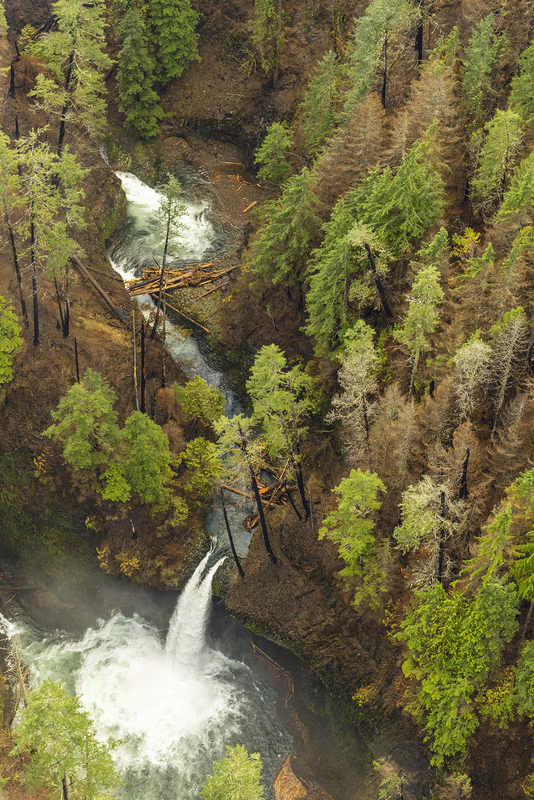 Can you describe how the area fared, especially the trail and tunnel behind the falls? Nate: So, the tunnel is in perfect condition, if not better, because of the ferns growing down from it created such a neat little curtain around the edges when hiking out of it. Without hiker traffic over the past year, the plants growing out of the cliff wall near tunnel are actually overtaking the cables, so much that it was difficult to even find the cable! The plants have grown so much along the cliff that they’re in your face if you do hold onto the cable. 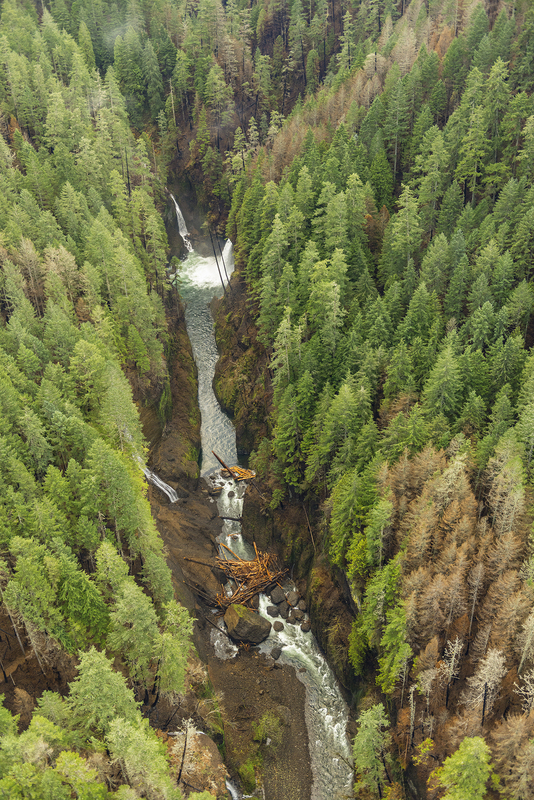 The area around Tunnel Falls did not fare too well. There were a few trees near the falls that had a green crown or had completely survived, but the rest of the forest here burned. 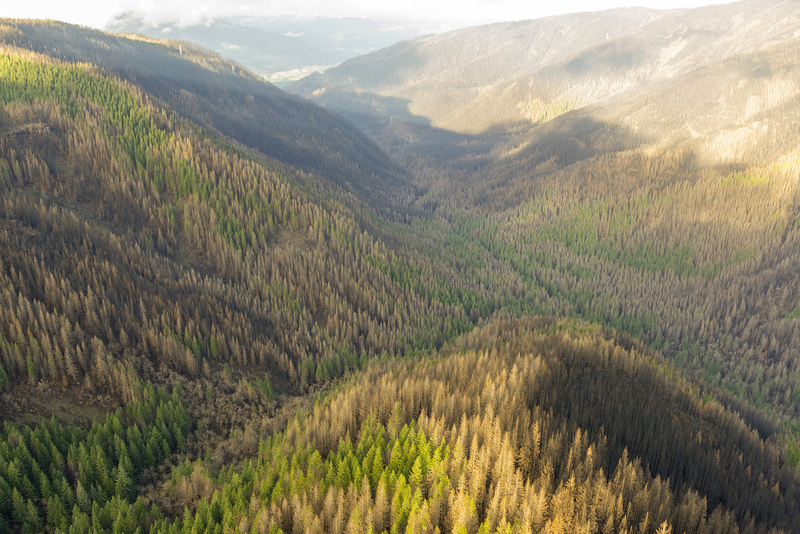 A few of the burned trees had a bit of green remaining, just we will have to wait and see if some of these recover. The south (upstream) side of the falls had a few landslides and a wash out, but the north (downstream) side of the falls is just terrible, with lots of work needed to get the trail restored. Some parts in this section are completely washed out, some are buried under slides and the rest will need a little reconstruction, so we’ll see what the future holds here. Tom: Your photos show a real surprise just below Tunnel Falls, where the trail passes a cliff section high above Grand Union Falls. You came across a cliff collapse here that covered the trail with debris! Was the trail, itself, intact under the debris? And how did you manage to get through that section..? It looks pretty sketchy! Nate: Oh, that was a surprise. It was just so unbelievable. The scouting trip almost ended right there and it wasn’t even close to noon. I’m not sure if the trail is perfectly intact, it’s really difficult to make that call considering there was up to five feet of microwave-size rock on top of it. But whatever is holding the debris is most likely the trail shelf, so maybe the trail is intact under all that rockfall. If I may add, the cliff collapsed right onto the “pothole” section of the trail [where blasting the original trail left concave bowls in the columnar basalt], so it’ll be interesting to see if any of those formations happened to survive. We spent a good 20 minutes deciding if we would be able to continue past the rockfall and searching for a safe route across. I’ve opted to crawl my way over the rocks and hug the wall as slowly as I could, since it seemed stable enough to hold my weight so long as I watched my step. My scouting partner opted to go below this cliff section, scrambling below the trail, traversingthe rockfall, and climbing back up to the trail beyond the collapse. Our crew leader and another volunteer also scrambled across the slide later to meet us when we were coming back up the trail, so three people were cross the collapse in both directions, but it definitely was not safe enough for regular work crews. Based on our experience, the collapse was declared impassible for safety reasons, as it is just too risky to send people across. Tom: When I first saw the photos of the cliff collapse, my immediate reaction was how much fun —but also dangerous— it will be to roll those boulders off the trail, since it’s a good 50 to 70 foot drop-off! Does the PCTA have plans for volunteers to do this work, or will it be left to Forest Service crews? Nate: Both of us thought the same thing! How fun would it be to watch and listen to those rocks tossed over the edge! The project I worked on along lower Eagle Creek had many of those and it always brought a “Woooo!” moment to everyone. I’m not really sure who is going to tackle this rock fall. There was a PCTA crew planned shortly after our trip but winter weather has forced the project to be postponed until next spring. So, we’ll see. Tom: One of the photos you took in the trail section near Wy’east Camp and Blue Grouse Camp shows Western hazel sprouting from its charred base. Can you describe the recovery in this part of the canyon? Did the tree canopy survive here, too? How did the trail, itself, fare in this section? Nate: Those sprouts were everywhere! In every direction you’d see sticks poking out of the ground and at the base of them is a little or big patch of green, so these guys are wasting no time in recovering. Amazingly, Wy’east Camp was left completely untouched. My scouting partner described it as “a little oasis”. Most of the canopy has survived around Wy’east camp as well, and looked promising for the future. It still amazes me how Wy’east Camp was spared that way, and it might be one of the few places along a Gorge trail that survived that well. Tom: It would good to see the intact 4½ Mile Bridge in your photos! 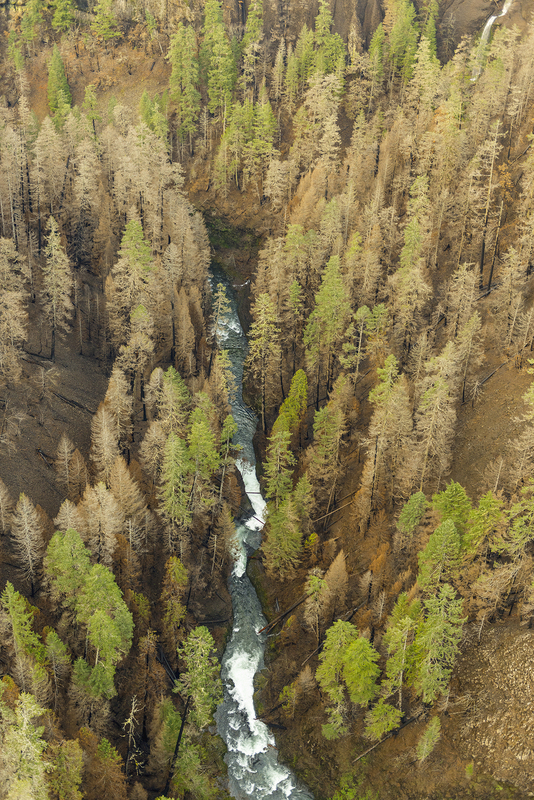 The photo below shows several big conifers just below the bridge that survived the fire, too, plus a large downfall. Can you describe what you saw in this section of trail? Nate: Just above 4½ Mile Bridge there was a section of trail that was kind of in a little valley of it’s own, and most of it was buried under a foot or two of rock for a good hundred or so feet. The cliff section downstream from the bridge was buried in a few feet of soil and rock, so had to dig in some steps to get through because of how steep the slide had settled. The canopy in the cliff section also survived pretty well, but immediately downstream from the bridge the forest mostly burned up with only a few survivors to tell the tale to new growth. The big tree across the trail will definitely need a patient crew to tackle it because of its size. There were many downed trees on the trail, with lots of branches that forced us to either crawl over, through or under the trees. I even had to to take my pack off in one place just to get through. Tom: The photo of 4½ Mile Bridge also slows a lot of plants growing right across the trail! That’s surprising to see, after just one year of this trail not having heavy foot traffic. Was this common along the trail? Nate: For most of the trail there was just a whole lot of rock, downed trees, and a lot of stuff trying to grow back. So yes, it was pretty common to see a bush or some ferns branching out over the trail, or grass creeping in on it. It really is incredible to see everything grow back so quickly! Just like the trip on the Larch Mountain Trail, where the big ferns have already grown over the trail and needed a lot of trimming. I felt bad for hacking at all those huge ferns, but it needed to be done. I can only imagine how much grow will happen next spring at lower elevations. 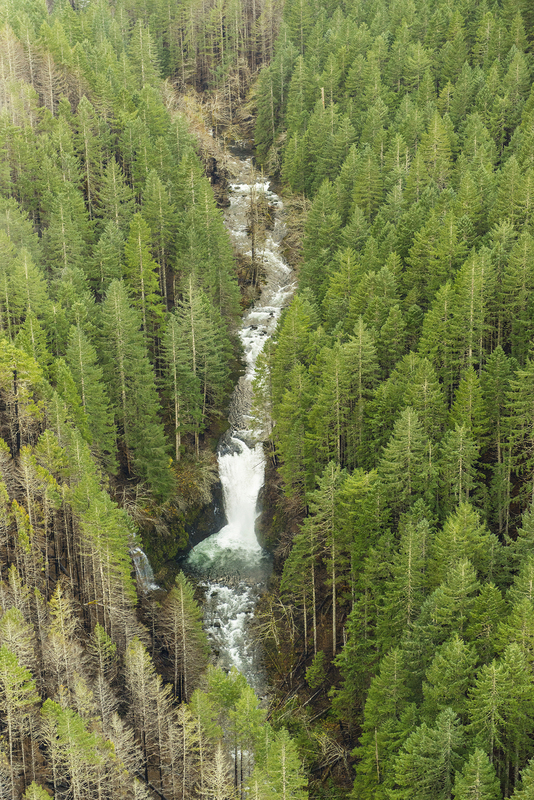 Tom: One of the surprises from your scouting photos was the view of Skoonichuk Falls from the trail! While this is one of the major waterfalls along Eage Creek, it was also one of the most difficult to see from the trail. It looks like the fire not only opened up the view, but also burned pretty intensely here. 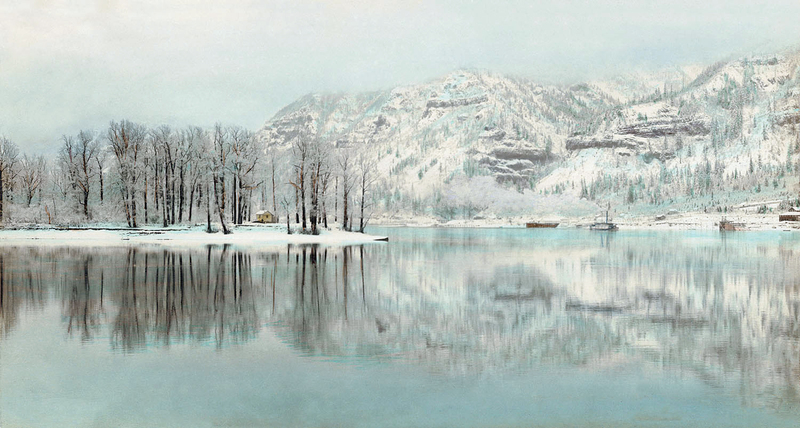 Can you describe the scene in more detail? Nate: It was really cool to see! New views thanks to the fire, really. Skoonichuk had been a waterfall I’d always miss because it was so protected from view. And you’re right, the fire did burn more intensely here, with the majority of the canopy gone. There were a few lucky survivors here and there that are just barely holding on. I’m guessing it’s probably because the trail was a little higher in that area and had more sun exposure to dry out over the summer before the fire, which just let the fire roar through. The trail was in pretty decent shape in this section, considering it was a high intensity burn in there. Just some branches and rocks on the trail, but otherwise pretty good shape. Tom: Another surprise in this section of trail is the pinnacle along a section of cliffs that had been hidden in the forest before the fire. What is this, exactly? Nate: This was a cool find, I’ve never noticed the pinnacle before the fire, and seeing the burned trees with its branches still attached provided a clear explanation why the pinnacles were not visible before the fire. And like you’ve said, the fire definitely opened up the view, which is very common throughout the trail and the Gorge. I noticed many more new views from the trail because of the fire, the pinnacles being one of them, which is pretty neat. Seeing dozens of new views and a few amazing ones, it makes me wonder what other secrets are hiding out there. Tom: Your scouting photos end at the upstream end of High Bridge, another iconic spot along the Eagle Creek Trail. It looks like some of the forest survived, here, but I can see why you didn’t go farther downstream — the wood deck burned away on the bridge! The thought of crossing a 90-foot deep gorge there without the benefit of bridge decking is more than a little scary. Can you tell us more about how this area was affected by the fire? Nate: So, some of the trees around the bridge survived completely, and most of the trees around the bridge survived, though a little scorched. Most of Tenas Camp had burned completely away, canopy and all, leaving nothing but rock, roots and snags behind where tent spots used to be, which was a fantastic example of just how much material had burned away with the fire. If the thought of crossing High Bridge in its current condition is scary, imagine standing at the edge of it! We’d already crawled over the cliff collapse above a major drop, but just standing beside the burned bridge made me nervous. You won’t find me crossing this bridge any time soon without a reliable safety harness. Heck, even when it had decking the bridge still wasn’t a comfortable place to lean over! Even though we had only ¾ of a mile to Fern Creek Bridge, which was our goal, the obvious decision was to end the scouting trip at High Bridge. That leaves that little ¾ mile section below the bridge as “the land of the unknown”, as I call it, since crews scouting the lower trail have only made it to Fern Creek Bridge. To this day it’s bugging me that we were so close, and yet it’s still a mystery. Tom: That’s right, so earlier this year, you were also part of volunteer crews working the lower section of the Eagle Creek Trail. How close did you get to High Bridge from the other side? Can you tell us how that section of trail fared? 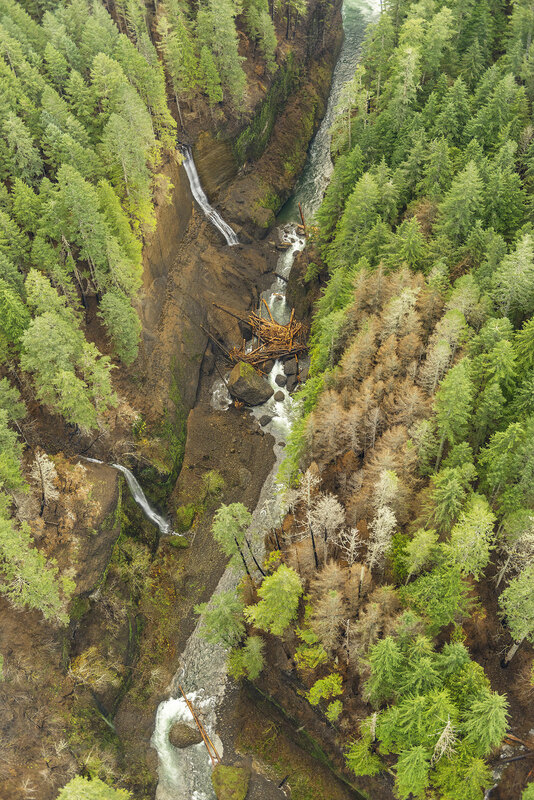 Nate: What I’ve heard is that later crews made it as far up as Fern Creek Bridge, which was burned out like High Bridge and declared impassible, splitting the upper and lower Eagle Creek trail sections in two for now. The furthest I’ve made it up the lower section was to Tish Creek Bridge, which I was so happy to see intact! I’d been on the volunteer crews back in February 2017 that cleared a snow path for the installation of that bridge, and when we were back there after the fire, I don’t think I’ve ever been so happy to see a bridge before! Lower Eagle Creek Trail has taken a very heavy beating from the fire. Slide after slide after slide, some taking multiple trail volunteers and multiple crew trips to clear. Much of the trail was just littered with baseball-sized rock, with a big slide in a gully along the trail. 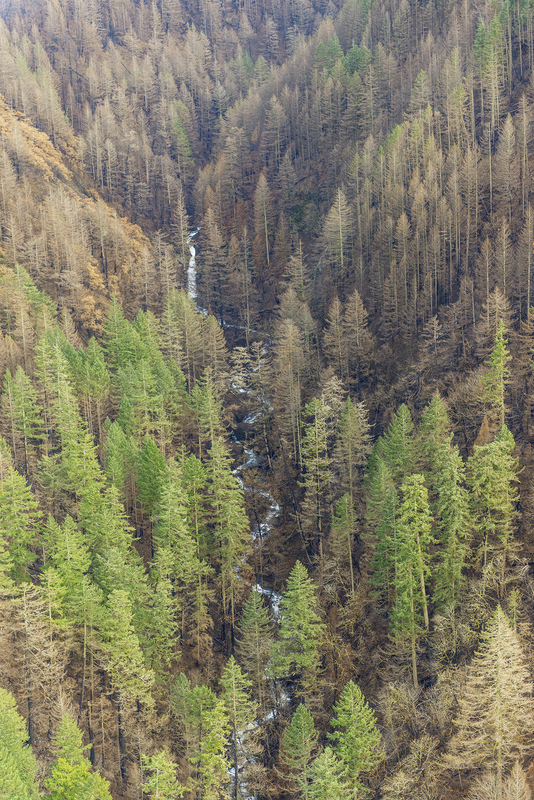 Yet, lower Eagle Creek canyon had many more trees survive the fire. Tom: The main purpose of the PCTA overnight crew in September was to work on the upper section of the Eagle Creek Trail, and you took several photos of the volunteers working on trail restoration. Can you describe what we’re seeing in this sequence? Nate: Much of what we were doing in places like that is bringing the tread back up to standard and removing logs from the trail. A couple volunteers were working ahead doing some brushing in places that that were a bit overgrown, followed by crews doing tread reconstruction and clearing small logs and branches. In the above photo, the volunteer in distance is brushing the trail corridor and the two volunteers in the middle are following behind, cutting the trail back into its original location. This system worked pretty well and we managed to restore a pretty good chunk of trail in just a few hours. Tom: Nate, thanks for all the time and energy you’ve put into helping with the Gorge recovery. Would you like to share any other thoughts on the experience and what it has meant for you? Nate: Thanks again, Tom! It’s been an incredible and truly life changing summer. The whole experience really is once in a lifetime. This is a fire that will go down the ages because of how many people were affected by it, and really, because the Gorge is like a national park to people. 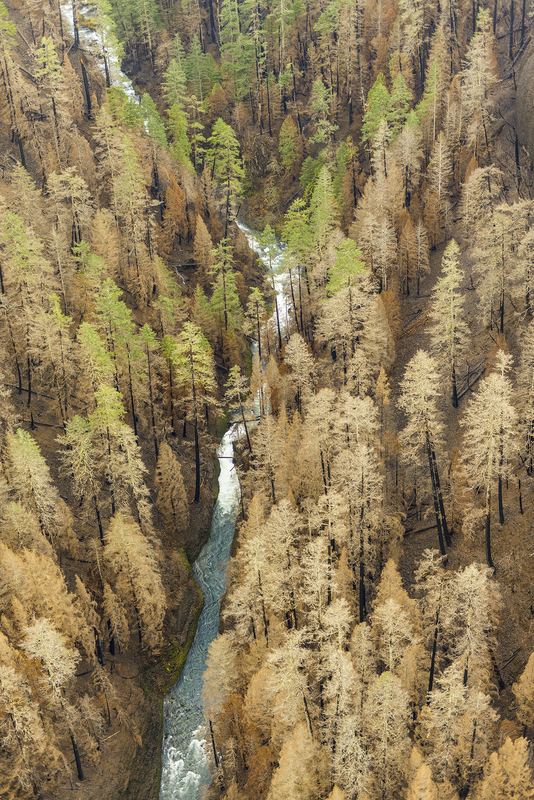 If Yosemite Valley burned the way the Gorge did, it would never be forgotten. 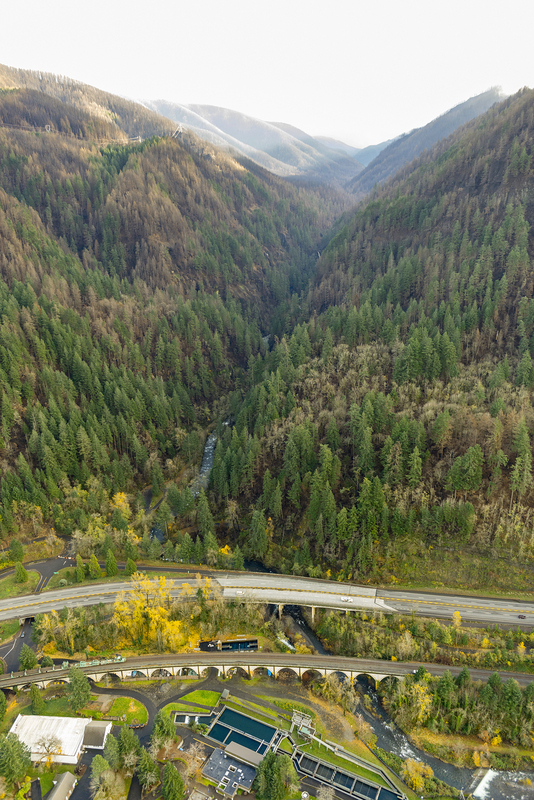 I believe the fire has been the best thing to happen to the Gorge since being designated as a national scenic area, because it brought people from as far as D.C to work together on the recovery. 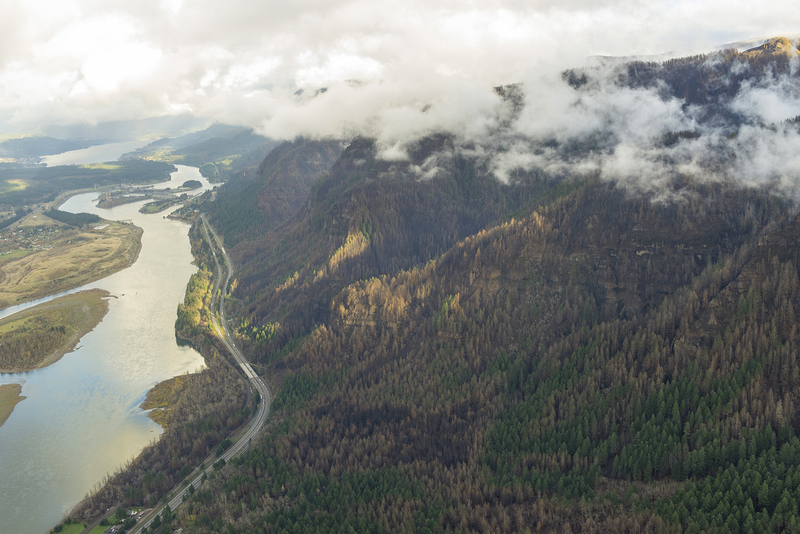 Without the fire, the Gorge Trails Recovery Team would never have been created, and the way the fire brought thousands of people together to get out on the trails and help in the recovery is truly historic. It had been almost impossible to get a spot on a volunteer crew earlier this year because of how fast they filled up! We’ve always had the Gorge right there and available, so when it suddenly shut down overnight, I feel like everyone suddenly realized how fragile it is. Most of the best trails were closed and the places we knew and loved were so close but so out of reach. Hopefully this will inspire more people take better care of our environment. This trip and the past summer has meant the world to me. 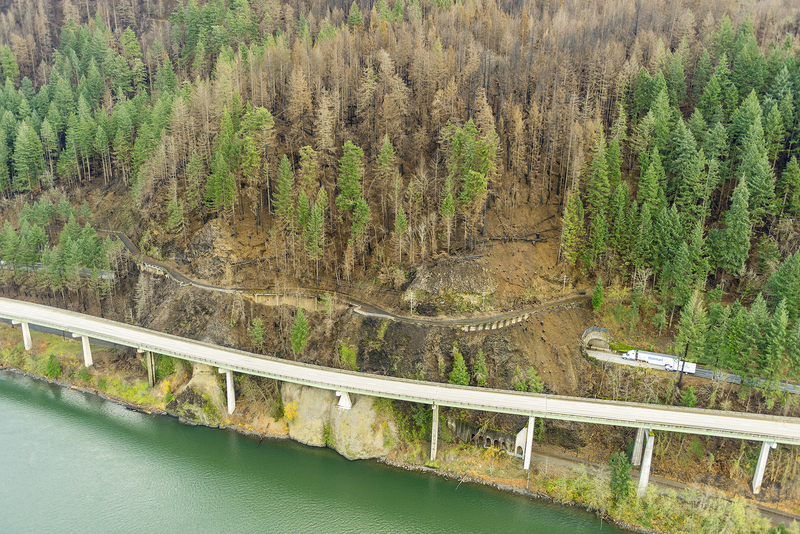 It has changed the way I look at fires, how the Gorge recovers from them, and how much work goes into maintaining a trail. I’ve met a lot of great people on the trails, and that is probably the best part about it. It’s been a rough summer for me, both mentally and financially, and being out there fixing a trail that millions enjoy brought me a lot of peace and really made me a much better person. I wouldn’t trade those experiences for anything! Tom: Thanks for taking the time to share this experience, Nate! I look forward to seeing you on the trail, again! Nate: You’re welcome! And thanks again for having me on here. I’m sure we will cross paths again one of these days. Tom: No doubt about that, Nate!